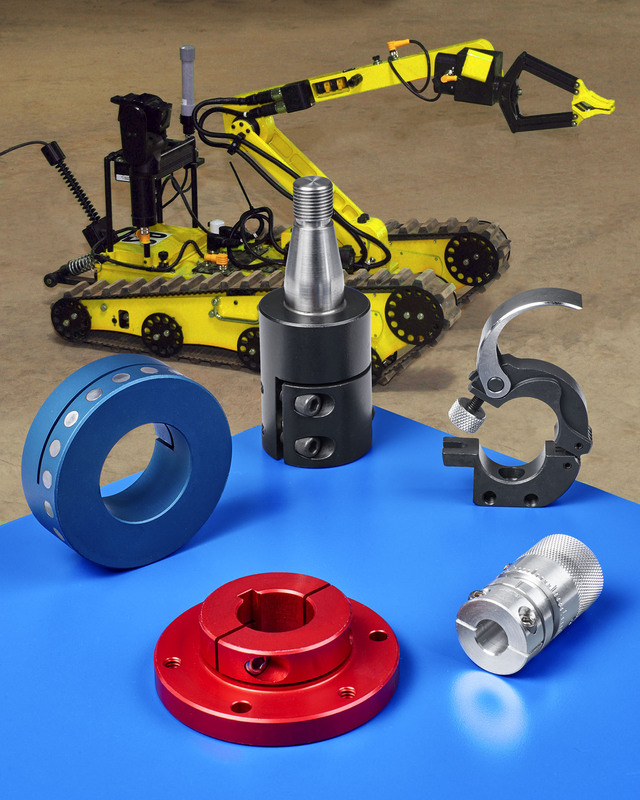 A wide range of standard and custom manufactured shaft collars, couplings, clamps, mounting devices, and rotary encoders are being introduced to robot makers by Stafford Manufacturing Corp. of Wilmington, MA. Stafford Shaft Collars, Couplings & Mounting Components for robotic appli-cations include 4,000 standard parts in a wide range of materials, sizes, and configurations. Suitable for mounting and adjusting drives, controls, and pick-up components, they include the Staff-Lok™ hinged collar which is easy to open-close and clamp by hand, one-, two-piece, and hinged collars, and a variety of shaft couplings and adapters for joining different shafts. Providing a rigid permanent stop, spacer, and shaft mount or an easily adjustable solution where required, Stafford Shaft Collars, Couplings & Mounting Components are available made from steel, paintable steel, stain-less steel, anodized aluminum in colors, plastics, and other materials. Sizes can range from 1/4” to 6” I.D., depending upon the part and material. Special mounting patterns and other part modifications are available. Stafford Shaft Collars, Couplings & Mounting Components are priced according to configuration and quantity. Price quotations are available upon request.